Eighteen days into the 34th season of “Survivor,” Zeke Smith was outed as transgender by fellow contestant Jeff Varner. The action was quickly rebuked by other participants and host Jeff Probst, resulting in the unanimous elimination of Varner the same night. It has now been a year since Smith was outed on television, and he’s currently using his platform to serve as a role model for transgender people everywhere. He tours universities and gives speeches around America, working with GLAAD and other LGBTQ+ organizations, to share his experiences with discrimination, mental health and being a public figure. Caitlin Stavish, president of BU’s chapter of Active Minds, a club dedicated to spreading mental health awareness at universities around the United States, said the event “kind of fell into [their] lap” after a colleague’s friend casually reached out to Smith. 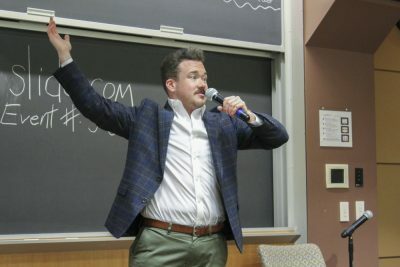 Active Minds then decided to organize Smith’s appearance, held Thursday at the College of Arts and Sciences in collaboration with Trans Listening Circle at BU. As part of his post-survivor life, Smith said he’s made it his mission to “change the search result” of the phrase “transgender outing.” He also spoke openly about his struggle with depression in college. He cites “Survivor” as one of the things that helped him during his darkest times. Smith said “Survivor” gave him a new flame to begin living his life again, and he started practicing survival skills. After moving to New York, he realized he couldn’t let being trans stop him from pursuing his dreams and he decided to audition for the show he loved so dearly. Smith said the night he was outed was the night his image of himself changed. He and Probst made the decision to spark a greater conversation rather than let episode six become a tragedy. When the episode aired, Smith said he was met with an outpouring of love on social media. He now meets thousands of “Survivor” fans and students to talk about loving themselves. Smith also meets many transgender boys and their parents, which he said has changed his outlook. Robert Rosado, a senior in the College of Engineering, said he came to Thursday’s event for the cross-section between mental health and LGBT issues, though he did not see Smith’s season. As Smith continues to speak about mental health and being in the LGBTQ+ community, his advice to college students is to find allies who will support and fight for them.